Austin NeuDecker is the founder of Membright a unique mobile app that helps people control what they remember. He is a graduate of MIT and Y Combinator. He's considered a serial entrepreneur having been involved in a number of startups. As well, Austin dedicates a large portion of his time to mentoring in the San Diego startup community. He's passionate, experienced, and has a wealth of knowledge to share. Paul: Hi there software entrepreneurs and welcome to today's show. Now, we're up to 21 shows now at the time of this recording and the Disruptware Podcast is doing extremely well, it's ranked well on iTunes, but it could really do with your help and support in subscribing and reviewing. Leave some comments on iTunes or Stitcher or wherever you find the podcast. Provide us some feedback and if you haven't got time to that, I totally get that, so just go to the blog disruptware.com and leave a comment, give us some feedback on what you want to hear on the show. Because what we're trying to do is provide you with strategies, tips, ideas and motivation so that you can build or scale your software business and have the success that a lot of the people that I have on the show are getting. Today, what I want to do is have a chap called Austin Neudecker on the show and Austin is an ex-MIT grad. He's been in Y Combinator, he's a serial entrepreneur and heavily involved in the San Diego startup scene. Now, he's recently launched a new product called Membright. And it's a fascinating piece of software that runs on the mobile platform. And, without further adieu, I'm going to get him on the show to talk a bit about that and talk a bit about entrepreneurship and startups as well, because he has worked in a number of VCs and has a wealth of experience in that arena. So let's get started. Hi Austin, welcome to the show. Austin: Thanks for having me Paul glad to be on. Paul: I really appreciate you taking the time out of your day. As you know, Disruptware is all about exploring different ideas, concepts and strategies that really work in the real world for people who are looking to sort of start up their new business. But also people who already have a product and have a software company and looking to scale. I was particularly interested in chatting to yourself for a couple of reasons, one because you've had a lot of experience with a few startups. And some were good, some failed as well and I think we can all learn a huge amount of strategies and tips and techniques of things not to do and I'm sure you can help us out there. Also, to tell us a bit more about your new company Membright and a little bit about the San Diego startup scene. To get started, tell us a bit about yourself Austin. What's your sort of background or how did you get in to this world? Austin: Sure yeah, so I actually grew up in San Diego where I reside now, but I ended up going to undergrad at MIT in Boston and there I studied Electrical Engineering, Computer Science and Business. After that, I basically tried to start a company right out of school which didn't work the first time. We were trying to do basically podcasting for publications like The Economist, to almost have like an audio version of all their different articles. That was going pretty well. We started to raise some money, eventually decided to shut it down and I joined, I sold my soul and joined a management consulting firm. And I actually really enjoyed it. I learned a lot working across many different big industries. After a while, I got the itch again and I really felt like I wanted to be the master of my own destiny. So I left that and went back to business school at Wharton at U-Penn in Philadelphia. After graduating there, I kind of knew I wanted to get back into startups. I ended up joining a couple of venture capital firms. So I joined, first, a firm out in the valley called Foundation Capital just doing sourcing for them, trying to find businesses that would be relevant to them. And after that, I joined a seed stage fund called Genacast Ventures that works primarily on the East Coast. After that, I decided okay it's time to actually try to start something myself rather than investing in companies and started a couple...string of startups. One was a smart pill bottle which used capacitance as a means to judge exactly how much medication was inside of it and then alert a patient and a provider when someone was not being compliant with their medical recommendation. Paul: That's cool. Is it actually sort of like an awareness of how much was left in the bottle or whatever? Austin: Exactly, yeah. On both sides of the bottle where these capacitors that were judging kind of the resistance that the pills or the liquid created in the bottle and then up at the cap was a way to wirelessly transmit that information so we could process it and then send alerts back to the patient to say, "Hey grandma the blue pill is really important, you got to take it today." Or to the provider to say, "Hey, Johnny is not feeling better because he is not taking his medication or he is taking some medication, we need to change the medication itself." Paul: Got it, or he's emptying it and filling it up with tea or something. Brilliant, so what happened to that startup? Austin: So that startup is actually still going. My partner Josh is I think running it really well and I think they're in a couple of hospitals in the Philadelphia and New York area now and I think growing pretty well. Paul: Excellent! And you know, just take a step back a second. You were working for a couple of VC companies and I think you said in...did you say in the sourcing role? Were you looking for potential things to invest in or were you looking for like potential funds? Austin: Yeah, when you get started in VC and I think that's probably a whole other discussion to have, but when you get started in VC which I would describe as the best job you should never take. I was really just trying to find companies that fit the profile of what the first firm that I worked for wanted to see. So I was really looking around basically the East Coast trying to send interesting businesses to a West Coast investor. And that was just kind of my way to get into the business and kind of understand better what they were looking for. And then eventually, I found a great role working for a guy by the name of Gil Beyda at Genacast Ventures which is kind of an unknown but I would say rock star seed firm that's been very successful in their first ten investments and I learned a lot working kind of as his right-hand man doing everything from this aspect to evaluating the business, what we called due-diligence. And then making decision on investing in them, sitting in to board meetings, following up with portfolio companies. So it was really the whole process of that investor goes through. Paul: Got it, I guess to form a sort of takeaway for people, what would you say were like the three most important things that an investor would look for? And I guess that probably translates into what the three most important things that make a successful startup. Austin: Yeah I think that that's fair. And I think so the kind of clichéd answer that you'll get and I think I'll mirror it to a certain extent then tell you why there are some exceptions. Is it that team and market matter the most in the beginning? Meaning like, is this a great group of people going after an interesting opportunity and hopefully there's some relevancy between the two? Do these people have some background or some reason why they're particularly geared to go after this opportunity? And then kind of a distant third would be the particular idea that they have to go after that because the thinking generally is if it's a good team and it's a good market, they'll kind of pivot enough and find something that works even if their first idea is not the right one. I'll kind of caveat that whole thing with saying that's really important for an early stage startup something that's really just getting going. As you get deeper into the startup and you start growing, a lot of the prioritization of those things and new things start to come into the picture. That's more about the particular product and the financials around that product whether you're going to acquire a customer for cheaper than their lifetime value is to the business. So these things kind of move in this spectrum. Then it's like, "Can you recruit talent quickly? Can you learn how to be more scalable fast?" Those things start to matter more as you get older. Paul: Right, got it! So, from there, you did a Y Combinator startup right? Austin: Yeah, then my next company was Yealthy and we went through the Y Combinator program in the summer of 2012. Paul: Right! Just tell us a bit about that. Austin: That company was basically trying to go down the tele-health kind of general path we were trying to give providers that's either doctors or nurse practitioners a way to mobile chat with patients. A really big opportunity, a really interesting opportunity, but as I was sharing with you earlier, it's always difficult in the healthcare space to find these entry points. Just given the regulation and kind of the large players that are existing in the space that have kind of an interest in keeping you out. Healthcare tech companies are kind of made or broken very quickly in the first year or two. Paul: Right, got it! Now, you're at the stage now where you've just started a new company called Membright, right? Austin: Right, yeah, that's right. Paul: Now, we're in the sort of software space. Just tell me a bit about Membright, what's the concept behind that? Austin: Sure, so at a high level at Membright, we're trying to help people control what they remember. We're trying to give them the tools that kind of mirror the way that your brain retains information and then give them the ability to either select existing information, whether that be input by yourself or somewhere that you find it online or finding existing content from kind of trusted content creators and then saying, "That information is important to me, I want to remember it." And then we do all the hard stuff that mirrors how your brain works to keep it in your head. Paul: And you know what I loved about that as I was talking to earlier about how you went out to get your first customers on there, because often, one of my first questions I ask people is, "How do you get the first 20? How do you get your first 50? How do you scale from there?" Obviously yours is a brand new product but you got an interesting story as to how you actually got people using it straightaway. Tell me about that. Austin: Yes, so one of the challenges with Membright was we've got this great technology and we've got some really interesting ideas of how to implement it but we didn't know specifically which application the technology was going to be best so we started building these tests. The first test we made was, "Hey let's put in some content for teenagers to learn how all the rules of the road." So when they go to take their DMV test, they are prepared to take that test. So what we did is we kind of made a really basic application that had that information in there and used some of the techniques we had. We bought four different Nexus tablets and then I went down to the DMV for a couple of days. I knew there was going to be a long line as there always is at the DMV unfortunately. Paul: Tell me about it. I discovered that as a Londoner coming to the US and getting his driving license. That was a bit of a shocker. Austin: I'm sorry and welcome to America, but yeah, there's this long line out there and I figured, "Okay, these people are going to be waiting there with basically twiddling their thumbs. This is an excellent opportunity to get some user feedback and to see if it actually works. So we took those tablets, we handed them out to people in line and we said, "Hey if you really want to pass your test that you're about to take, why don't you use this tool for 10 minutes to 15 minutes while you wait? It's an easy interface, just click through it with your finger." And we found that A, it was easy to get them to do it because they weren't doing anything else and, B, the first time pass rate of these 50-100 users that we had went up to about 50% more. So they usually pass it about 50% of the time, they passed it about 75% of the time and that was only using our tool for about 10 minutes, so we were pretty happy with those results. Paul: That’s cool! Did you pre-load it with all the questions? Austin: Yeah we did. We went out and got that content, we typed it in. Paul: I got it, and how did you know it was just the group that did...that actually used your app that passed? You actually have to survey people coming out? Austin: Yeah exactly. Kind of part of the deal was that you can use our tablet, you can mess around but you got to, on your way out...luckily, there was only basically one door at that place. I said, "Hey you did you pass or not?" Paul: Yeah! What about the poor people who didn't pass? "But you didn't give me a tablet." Austin: It was interesting, the few that didn't pass came back out and they said, "Give me that tablet, I'll do again." They said, "I got to practice some more." They would play with it some more, they would go in and they come out with a smile on their face. Paul: Excellent! Did you make any sales off that? Austin: No, we weren't selling the product at that time which is a great point. In some cases you want to validate whether people are willing to pay for it and in this case, the test was more is this effective, does this work. We were able to validate that hypothesis. Paul: Ok, brilliant. For a customer buying this app, in terms of the actual content, the domain content, do they buy packages of that or can they load it themselves? How do you actually create the content? Austin: Yes, so these are all great questions that...like I said we're very early. I can give you some initial responses, but I can't be held to them I think in the long run. The app is actually...I hate to say it but it's very alpha and it's got still a lot of bugs in it, but it's available right now in the Android, iPhone and web versions. You can get them on any of those and play around with it. But, the thought eventually is can we find content producers. Let's say Paul wants to take this interview and he wants to say, "Hey Austin made five interesting points that any entrepreneur should commit to their own minds so whenever they're thinking about their startup, these things kind of come up in their head." So we would allow you to kind of have a button at the bottom of your blog which would allow a user to add that to their brain. It would go into their Membright system and the Membright system basically reminds them everyday like here are the few things that you need to just be reminded of today, just at the time you're about to forget it. Paul: So you basically you kind of provide the framework and you partner with content providers, put the two together and insert into my brain please. Austin: Exactly, it’s just a very empowering feeling because this is something that we've all kind of given up on memory. We've basically said if I need a piece of information I’ll just Google it or I'll find it in my Evernote or something. But that doesn’t work for information we really need. You can’t go up to someone and forget their name and then say hold on a second while I look you up on Google+ or something like that. Or you can't be communicating with someone and then say "Hey, hold on let me look up my Evernote, 5 Negotiating Tips." For that type of content, you just need to know it and we take care of all the hard stuff that puts it into your brain and keeps it there. Paul: That’s fascinating. I think it’s something that everyone wants is to improve their memory. I speak to or put the hand up and say "my memory is rubbish" I mean I know mine is. And I kind of know some techniques to improve my memory or let me put it another way, I would know formal techniques of how to remember stuff, but the issue I often have is how to switch on that engagement to ensure that I choose to remember it. And I guess, where I'm going with that is that if I want to remember a list then I can visually picture the items on the list, sort of piling on top of each other in my head. And if I go through that process and engage my brain to go through that process then that list will be committed in my head. But like nine times out of ten in your everyday situation, you forget to use that technique. So any tool like this or something that you can use on a habitual basis or form a habit out of I think will be amazing for improving memory. Austin: Yeah, and these like you said there’s a lot of different memory techniques out there, there’s things called like The Memory Palace where you can picture things, you picture Napoleon on a horse with an ace of cards on his head. And there is a Mnemonics, and then there’s things like "space repetition" and we’re using some of these tactics especially space repetition in the backbone of the algorithm that drives the app and how it functions. So we’re basically saying "we will take care of all of that hard stuff." You just basically have to select content or pick some existing content that’s in the app and say "this is important to me and I want to keep it in my head" and we will kind of help manage that, so we're managing the brain for you. Paul: Got it. And that’s going to be really, really cool when that launches. How far away do you think that is? Austin: So like I said, we've kind of soft launched it kind of quietly to the Apple and Android stores. But I think it will take probably a couple more months for us to kind of get it pretty enough and be happy enough with the product to really go after a larger launch strategy. Paul: Sure, understand. Okay, brilliant. So let’s move on a bit because you’re in San Diego now and you are very much part of San Diego scene. What are your thoughts, in terms of the startup world down here now. Because you know everyone I talk to is just talking about how much this place is just rocking with tech startups and there’s lots going on, and the activity and the momentum is building and building. What are your thoughts on that? Austin: First off, that's great to hear. I always love it when I see an ecosystem. When I came here about a year ago, I felt like there was a lot of interesting startups, there was a lot of activity happening but it tended to be fairly siloed. It looked like there were groups around town that were trying to help startups in their own kind of bubble. But people weren't working kind of across groups to create a sense of real community. If someone was kind of entering, they didn't have like an entry point into that world or they couldn't see across multiple startups to join. My experience both as a VC and in programs like Y Combinator led me and a couple of other individuals in town to kind of get together and say, "Hey, let's change this. Let's make this more of that community feel that it has in other cities." We started a bunch of different programs that the whole main goal is to do that, there is no like owner of this startupsandiego.co group. It's really just entrepreneurs helping entrepreneurs and building programs that are specifically aimed at solving those specific needs that early stage companies run into all the time. Paul: What does that involve? Do you like run workshops and things like that? Austin: Speaker things happen all the time around the town anyway, so we didn't want to add an additional thing that was kind of not needed. Most of the things that we try to add are very pointed at solving specific problems. Our mentorship hours which I kind of modeled after the YC mentor hours that I had experienced are really just finding very successful people in town that have kind of been through it, they’ve exited a company. They're investing in companies and they would sit down with you for kind of these short, kind of speed dating mentorship sessions where they are focused on one particular problem that you have. We run these events very frequently. We run them every other week and then we run once a quarter a very big mentorship night. We have about 30 different mentors and maybe about 30 to 50 companies participating. Paul: Ok. And so, I would go to one of these events and I'd express like my problem and I'd be partnered with someone to basically expose it and talk over a solution. Austin: You basically have four meetings in a row kind of like speed dating. Each of those meetings would be 30 minutes and as soon as that meeting starts, the mentor would say, "Okay, tell me a little...three minutes about what your business is and where you're at and then let's talk about it." They say, "Okay, this is my startup and we're currently at this level and right now I'm trying to figure out how I can do Facebook advertising better. They say, "Great, I know about that. Let's dive into it." Paul: Right. I got you. Brilliant! That's fascinating! In terms of your experience, what would you advise people starting up or people scaling? What key sort of strategies or tips can you give my audience in terms of starting up making sure their product works? And then, anything in terms of scaling and in terms of getting traffic, getting conversions. Austin: I guess I was steeped in the Paul Graham's ethos of kind of like getting in front of your customers and making sure you find people that really love your product. I think that's kind of worth talking about deeper where I think there's a lot of engineers that start companies that really believe that the product itself will eventually be good enough and then we'll kind of win the day. People will hear about it, people will share it and somehow it will kind of blow up. But that's extremely rare for it to happen that way. Most likely it happens a very different way which is build something which is highly needed and highly loved by a very, very small group of users. A lot of people's time at the beginning should be spent both finding that group and working kind of hand in hand with that group, really trying to understand who those people are and what their needs are and filling those needs so much that those people, if you took it away from them they would be pretty upset. They don't have to necessarily pay but they need to have that kind of visceral reaction. This product is something that is required for me now and once you find that, you can start to figure out, "Okay what attributes did that community have that I think I can use the same metrics to identify a similar or approximate community that's maybe a little bit bigger." Then I think scaling is all about how to identify and go after those communities without having to have the high level of touch that you had to have with those first couple groups. 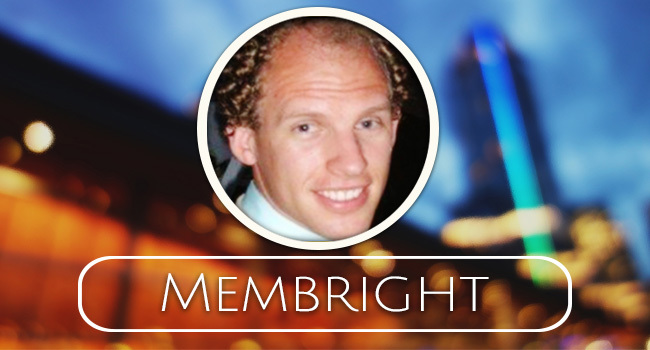 If I were to make it more tangible, when we started with Membright, we were looking for who's going to be that group of users and we happened to come across another guy in the San Diego ecosystem. He told us that he was playing this game called "Ingress" which I'd never heard of. Basically, it's a geo-location game based on Google's Android platform and you kind of go around town and kind of claim different parts of town and like fight the other team by placing things on the map. Part of that game has this glyph-hacking thing where you need to know these gestures. We had seen that other people that had used our application were reviewing let's say 20 different pieces of information a day. That would take about two to five minutes in their dead time. That was great. It was kind of nice to have. But for this group, these Ingress users, the ones that got their hands on this tool saw, "Hey I can get two times the items if I actually memorize these gestures." They saw such a benefit in it that they were reviewing 400, 500 cards a day. That gave us a great indication that wow these people...we didn't even know about this group but they really liked this product and they really feel like they have a need for it. So that was kind of the way we identified that group for us. Paul: Coming back to one thing you said though, finding something that's like really, really in demand for a small group of people. Do you think that's also very, very difficult for a lot of people to do? Coming up with those unique ideas is quite rare. Coming up with a ground breaking product is quite rare and yet you don't have to do that just to come up with a successful software product, right? I do kind of advocate that what you can do is look at something that is working in another market or something that maybe runs on a different platform. Or something that's very old fashioned and then re-invent that and take it to a new market or take it to a different population or make it more modern or slicker or whatever. By doing that, you’ve already proven, you already know that the market is there and ready for it. By making it fit this newer market, then you already have half the work done, you already know there's an appetite there for it, and so all you got to do is build it and obviously deliver it. Do you see where I am going with that? Austin: I think there is definitely a lot of different ways to come up with good ideas. One way is kind of like taking an existing product or technology from an existing industry and reapplying it to a new market. I think that's a very good one but definitely not the only one. Kind of what you said even in the same industry, if I could take a product and just even slightly improve it, but find people for which that slight advantage is actually very meaningful. Then you can really still have an amazing product. I hate to use examples like these because I think that they're part of the driver why people think that startups are easy when they're very, very much not. But taking Instagram for example. There were lots of photo-sharing applications out there before Instagram came on the scene. This wasn't like a new thing, but they kind of slightly tweaked this kind of filtering system and seems like a pretty small feature difference, but for some reason, that was kind of the thing that really took off for them. I think that that's particularly a useful way to think about B2B businesses and SaaS businesses because sometimes small features for large companies accrue big benefits to the bottom line. Paul: I interviewed Chuck Longanecker the other day and we were talking about this very thing. He came up with two concepts which really struck me. The first one was friction. If you can work out how to remove the friction of using something and make things simpler, then you will increase adoption and obviously you'll improve the emotional side of using something. The second thing is what he said was that, "Our life is all about experiences and experiences form the fabric of our sort of existence as it were. The more you can touch or have an impact on someone's experience with something, then the more they'll become engaged with it and use it." If you can find a product that's selling now and work out how to reduce the friction and how to improve the engagement and the user's experience of it to such a degree that it makes it fun, interesting or valuable to them, then I think that's one of the core fundamentals to making the really successful app. Austin: Yeah, definitely. Chuck's a smart guy and I tend to agree with him and definitely on this one as well where...it is interesting that startups these days are finding user experience to be one of the most important parts of the company. When I used to see companies start it was, do you have two engineers or three engineers and one business guy? And that was kind of a recipe for a good company. It's funny now that people look at, the VCs look at the world and even other entrepreneurs look at the world and they think of, "Okay, what I need to start my company is a software designer, a business guy and a user-experience designer." It's very interesting, that's definitely Chuck's approach to the world given kind of how he approaches his businesses. I concur with it, I think that I'm gonna be a little bit of a hypocrite because Membright right now is definitely not the easiest thing to use in the world. But we view our approach to go that way very quickly. We want to make this a tool that's easier than all other ways to put in information and to commit things to memory as just an example, so I agree. Paul: I guess to your credit though as well that the other thing about something like Membright is you need to get something out there working and get feedback before you make it perfect in terms of the UX and everything else. Because you got a concept there that you're really trying to prove in the market. I actually think it's very important. Get it out there, get the feedback and then look at the UX side of things. Austin: Totally. Yeah, to me those things are not only non-exclusive but they build on each other. The only way for you to get good user experience and I'm sure Chuck would back this up is to have users use it. The only way for you to know whether they're going to click on this button or that button or where their eyes are going to focus or if they're going to find the specific way that you display the analytics to be intuitive or not intuitive is for you to put that in front of a user and look over his shoulder and see what he does. You can kind of trick yourself into thinking that you are the super user and you are going to design it for yourself and therefore everyone else is going to love that. That's not how the world works. That's generally not how product design is done now. Paul: The other thing that I think when I'm talking to people who work on their startup and all that, sometimes they get so focused on the UX and on building the perfect product that's going to build this amazing experience that they forget like Marketing 101. They forget about some of the core fundamentals like getting traffic, getting a lead capture, actually getting leads and then creating a funnel so you can actually sell these things. And I think sometimes that a lot of this bread and butter marketing stuff to which every business online now is implementing just gets overlooked. No matter how good your product is, you have to get this core fundamentals in place to actually get eye balls on the product to start with. You know what I'm saying? Austin: Definitely. I absolutely think there's an interesting evolution going on within the marketing role. When I went back to school or when I went to school in the first place, MIT had actually a very famous marketing department and that's because as opposed to the rest of the world at the time which was thinking about beautiful pictures and great commercials and funny messages and stuff like that, MIT was thinking very quantitatively about how do we set the right metrics, how do we measure people's engagement, how do we frame things the right way to increase the amount of acceptance of a message. I was really steeped in that ethos and kind of learned a lot of from a guy, Dan Ariely, Predictably Irrational is his book. It's a great book and it teaches you about how to basically trick users into accepting your product and your pricing and all those things. But I would say is kind of a more broader view of the world. Startup marketing has become an extremely quantitative art form where you have to...like you said, know what your funnel is, measure every single interaction. We use a company called "Mixpanel" to mark exactly where the user came in from, when they engaged, which button they clicked, how deep they got into the product, how many cards they reviewed and how many decks they added. These are key metrics for us to figure out, "Are we being successful with this set group of people? Is this marketing message collecting the right type of people? Is our product working with taking people through the funnel?" So even though we are really early on this stuff, this is the mentality that we have as entrepreneurs. Paul: Absolutely great! Austin, it's been really fascinating chatting to you, what advice would you give sort of entrepreneurs sort of starting out? Where should they start? Austin: The first thing I would do is taking the idea itself and trying to create some representation of that idea without actually building much of anything and going out and market testing that. Trying to find some of those users that we talked about, some of those people that we expect might become those kind of extreme early adopters that are going to love this product so much that they're going to be mad if you took it away. How do I get my product in front of those people as quickly as possible or even just the idea of the product and see if they're connecting with it. From there, I might start to build out a little bit of an MVP and test that and just incrementally build as I get pulled from the market. Paul: Austin, it's been a pleasure and an honor having you on board. If any wants to follow up, how should they get in touch with you? Austin: They can email me directly at [email protected], that's M-E-M-B-R-I-G-H-T .com and I am happy to field any questions. Paul: Obviously, go to membright.com, have a look at the app, but bear in mind it's in alpha stage, but I'm sure Austin would love some feedback on that. Austin: Yeah, we love feedback. Every time anyone uses it, please send us a note and let us know how it can be better. Paul: Brilliant! Thanks so much Austin, I really appreciate you coming on the show.